Holding Back Access to Google Services. “Follow our rules or you can’t use Google Search”. This just pisses Google’s partners off and smells like anti-trust. Not that it matters, because Google can’t really do this because there are enough reasonable alternatives to Google’s services now. In addition, the battle of the social graph is causing Google to push Google+ everywhere. What strategy tax at Google do you think will trump the other: Android consistency or Google+ everywhere? Holding Back Access to the Latest Version of Android. “Follow our rules or you don’t get Ice Cream Sandwich, etc…”. Uh, it’s open source. Fork. More fragmentation. Simply. Will. Not. Work. Peter Bright’s recent article really brought home Google’s strategy for regaining control by suggesting that Google’s latest releases are bifurcating the useful features from the core Android Open Source Platform (AOSP) and applying what I would describe as a license fee to the Google Play Services (aka Google Mobile Services). The Google Play Services provides a wealth of APIs and system services: APIs for Google Maps, Location, and in-app purchasing; Google+ integration; Remote Wipe; Malware scanning; and more. Then there's the Play Store collection of apps: Search, Gmail, Chrome, Maps, and many more. 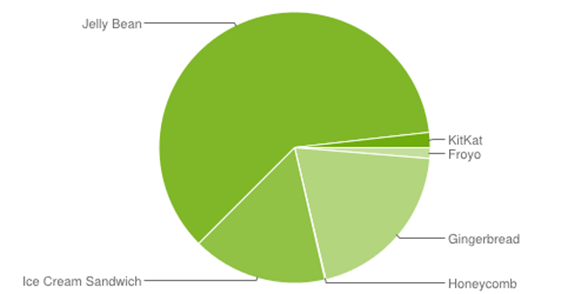 This chart has 60% market share for Jelly Bean (KitKat, the latest OS is at 1.8%). However, more than half of those folks (35.5%) are still on the oldest version of Jelly Bean, and there is still a whopping 20% of active Play Store users on Gingerbread. Ultimately developers will be left paying the price, the easiest APIs to work with are associated with Google Play Services, but we create apps to gain market share not to simply play with comfortable APIs. For Android developers the decision tree for determining exactly what devices and APIs to support remains a complicated one, and thus getting a consistent experience on Android devices will continue to be crapshoot for the near future.